There is a Benefice Holy Communion service at 10.00 a.m. every Sunday. 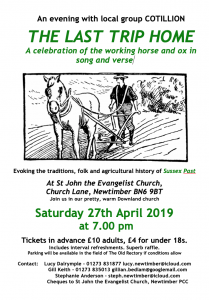 The three churches, Poynings, Newtimber and Pyecombe take it in turns to host it as shown below. In addition, there is a Holy Communion service twice a month at Edburton on the 1st and 3rd Sunday each month at 11.30am. There is evening service in Pyecombe on the 2nd Sunday of each month at 6pm.This is more informal and varied – usually taking a topical or seasonal theme. Worship in the Benefice follows the Anglican Common Worship Order One, with seasonal variations as appropriate. It is neither ‘high’ nor ‘low’, but in the mainstream of the Anglican tradition. We enjoy refreshments and fellowship in church after every service. Visitors and newcomers – including children of all ages – are always welcome – indeed, we seem to attract those from nearby areas who appreciate a traditional but not old fashioned service. Although we do not have a choir, we are blessed with organists willing to play for all our services, and we enjoy singing. At the evening service in Pyecombe, we often have a visiting choir, band or other musicians to help us. This is an opportunity for quiet reflection, as well as being a time when intercessions are offered on a regular basis for those who ask for our prayers. It is a said service, and we use the liturgy for Morning and Evening Prayer in Common Worship, with seasonal variations. The service includes a psalm and a reading from both Old and New Testaments. If you would value a quiet time, do come and join us – there may be as many as 10 people or as few as two, but God is always with us. At special times such as Christmas, Holy Week and Easter or for special occasions such as Mothering Sunday, we have additional services, which will be advertised on our monthly news sheet.